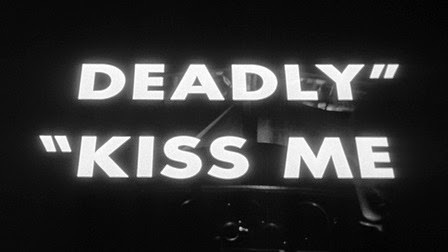 KISS ME DEADLY (1955), which over the years has come to be considered an iconic '50s film noir title, is the sixth film from my list of 10 Classics to see for the first time this year. 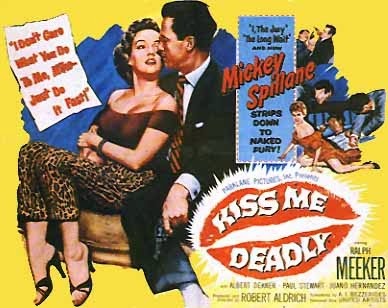 KISS ME DEADLY is a crime film centering on detective Mike Hammer (Ralph Meeker), who was created by writer Mickey Spillane. Last year I saw another Mike Hammer film, I, THE JURY (1953), at the World 3-D Film Expo and thought it was terrific pulpy fun, sort of a live-action cartoon. It featured a somewhat dimwitted Hammer (Biff Elliott) surrounded by a lively cast of zany characters, and it had the added plus of wonderful L.A. location shooting. I still smile remembering the twins, the seductive shrink played by Peggie Castle, the Christmas setting, the Bradbury Building, and the weird 3-D-induced sensation that Preston Foster was actually standing there in front of me. KISS ME DEADLY proved to be quite different from I, THE JURY. On the surface KISS ME DEADLY has plenty of elements I like: Film noir? Check. Plentiful L.A. locations? Check. Atomic era paranoia? Check. Eye-catching black and white photography? Check. It's even got a title song sung by a huge favorite of mine, Nat King Cole. This should be my kind of movie, yet it rubbed me the wrong way from the opening moments with Cloris Leachman -- someone I've never enjoyed -- breathing heavily for what seemed like eons. Meeker is a very different kind of Mike Hammer, very grim but not very charismatic. In fact, the entire cast is simply...flat. The pair of lookalike women wandering around barefoot in bathrobes just confused me. Jack Elam shows up for a bit to liven things up, but no one in this did much for me, other than wonderful Juano Hernandez (STARS IN MY CROWN), who unfortunately has but a single scene. The film has a couple of violent moments which manage to be disturbingly brutal without actually showing much, but they added to my distaste for the film. And the scene where Hammer breaks a record...well, I haven't ever been able to go back to BLACKBOARD JUNGLE (1955) because of a similar scene. Maybe it's because I'm the daughter of a record collector! The ending? Okayyyyyyy. I guess it was nervy having the "MacGuffin" actually be something. And now what? I think I've put off seeing some of the films on my 10 Classics lists because I had gleaned enough over the years to suspect they might not be my thing -- THE APARTMENT (1960) being an example -- but this is one I really expected to find more interesting. I know plenty of people who really like and admire this film so I'll put it on my list of films to revisit one day in the future to see whether my reaction changes if I see it in a new context or different mood. I did at least love Hammer's answering machine! 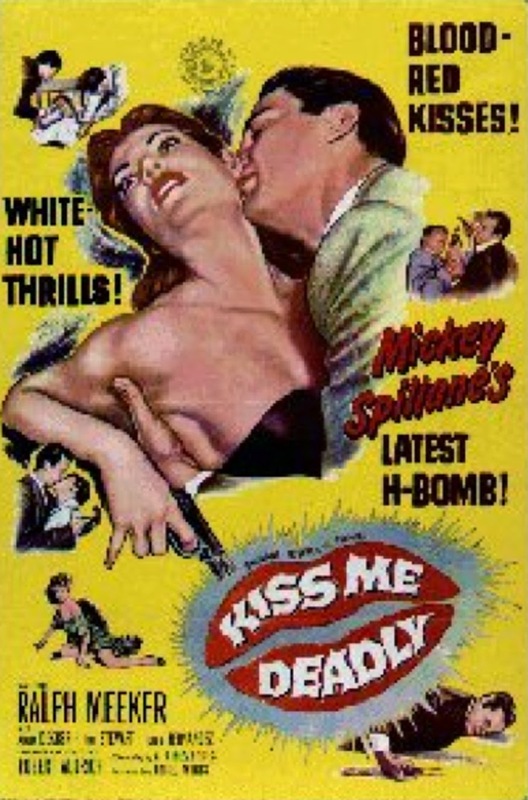 KISS ME DEADLY runs 106 (very long) minutes. It was directed by Robert Aldrich and filmed in black and white by Ernest Laszlo. The script by A.I. Bezzerides was based on the novel by Mickey Spillane. KISS ME DEADLY is available on DVD or Blu-ray from the Criterion Collection. There are many extras, with a couple of nice short pieces on the L.A. locations and Bunker Hill; I found it useful to watch these before the film as a guide to what I was seeing. I've been busy watching the final films on my 10 Classics list during my Christmas vacation and will review more as quickly as time permits! Best wishes to all for a very happy 2015! Two luminaries of the acting profession have left us as the year draws to a close. ...Actor Edward Herrmann, a member of the cast of GILMORE GIRLS (2000-07), has died at 71. The cause was brain cancer. Herrmann was also especially known for playing Franklin Delano Roosevelt in ELEANOR AND FRANKLIN (1976) and ELEANOR AND FRANKLIN: THE WHITE HOUSE YEARS (1977); this year he returned to the role by voicing FDR in the documentary THE ROOSEVELTS: AN INTIMATE HISTORY (2014). 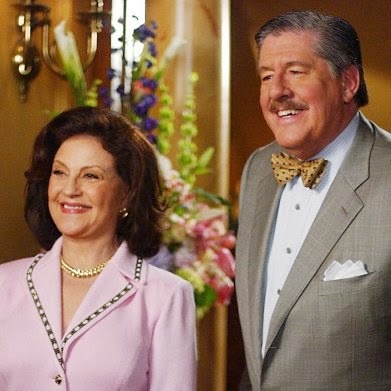 Actress Kelly Bishop, who played Herrmann's wife on GILMORE GIRLS, shared that she spent time with him at the hospital this week. GILMORE GIRLS was one of my favorite TV series so I was particularly saddened by this news. 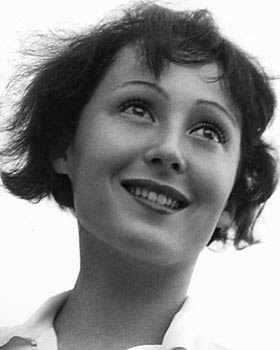 ...Actress Luise Rainer, a two-time Oscar winner for THE GREAT ZIEGFELD (1936) and THE GOOD EARTH (1937), has passed on. Rainer was just a couple weeks short of turning a remarkable 105 years old. She was a century old when she traveled from Europe to Hollywood to attend the TCM Classic Film Festival. Turner Classic Movies was due to salute Rainer on her birthday this January 12th, so I anticipate that day will now serve as her memorial tribute. 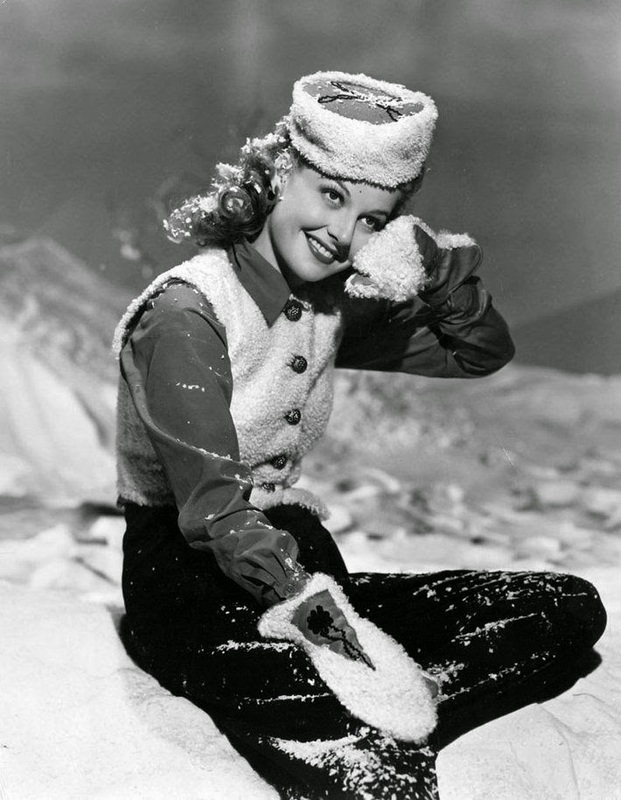 Her TCM Festival interview with Robert Osborne will be shown, along with seven films. Happy New Year, and best wishes for a wonderful 2015! I wish the fun of the holiday season could have lasted twice as long, especially as all four of our children came home in December, but there's some great movie viewing ahead in January! The January Star of the Month is Robert Redford, while the Friday Night Spotlight focuses on the films of Neil Simon. There will not be separate posts this month on Redford or Simon as their films largely fall outside the era of my greatest interest and knowledge. ...New Year's Day features films starring Joan Crawford, Bette Davis, and the Marx Bros. That's quite a combo to kick off the year! 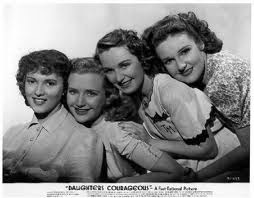 ...Director Michael Curtiz and 10 cast members from FOUR DAUGHTERS (1938) reunited for DAUGHTERS COURAGEOUS (1939), a completely unrelated but equally enjoyable film. Film historian George Morris called DAUGHTERS COURAGEOUS "neither a sequel nor a remake, but a unique mixture of paraphrase and elaboration." The stars include the Lane Sisters, John Garfield, Jeffrey Lynn, and Claude Rains. Airing on January 2nd. 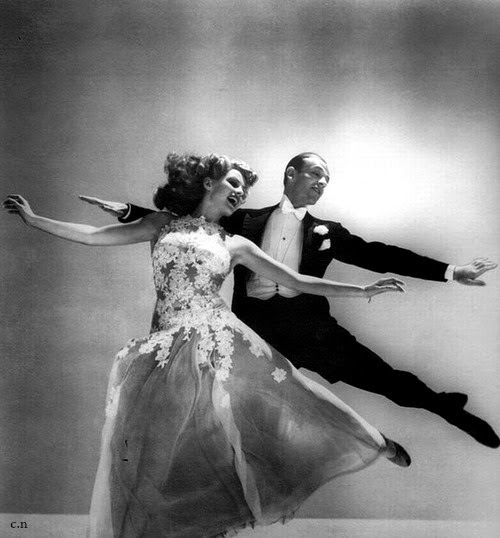 ...There are some wonderful films running on Sunday the 4th, including ANCHORS AWEIGH (1945) with Kelly, Sinatra, and Grayson; CRISS CROSS (1949) with Lancaster, DeCarlo, and Duryea; CAREFREE (1938) with Astaire, Rogers, and Bellamy; and CHARADE (1963) with Grant and Hepburn. A terrific day for taking it easy and watching movies. ...I'm fond of RICH MAN, POOR GIRL (1938), a lower-tier MGM picture starring Robert Young and Ruth Hussey in the title roles, with Lew Ayres and Lana Turner in support. 73 minutes of fun. It's followed by another early Turner-Ayres film, THESE GLAMOUR GIRLS (1939) which has a fun cast including Richard Carlson, Marsha Hunt, Anita Louise, and Ann Rutherford. Both films air January 5th. ...Most years TCM pays tribute to Loretta Young on her birthday, January 6th; this year the focus is on Young's pre-Codes, with a whopping 10 films in the lineup. Favorites include TAXI! (1932), THEY CALL IT SIN (1932), WEEK-END MARRIAGE (1932), and EMPLOYEES' ENTRANCE (1933). THEY CALL IT SIN is seen in the still to the right, costarring George Brent and David Manners. ...Before George Sanders played the Saint in RKO's series based on the Leslie Charteris character, the Saint was played by Louis Hayward in the very interesting THE SAINT IN NEW YORK (1938). It's on January 7th. 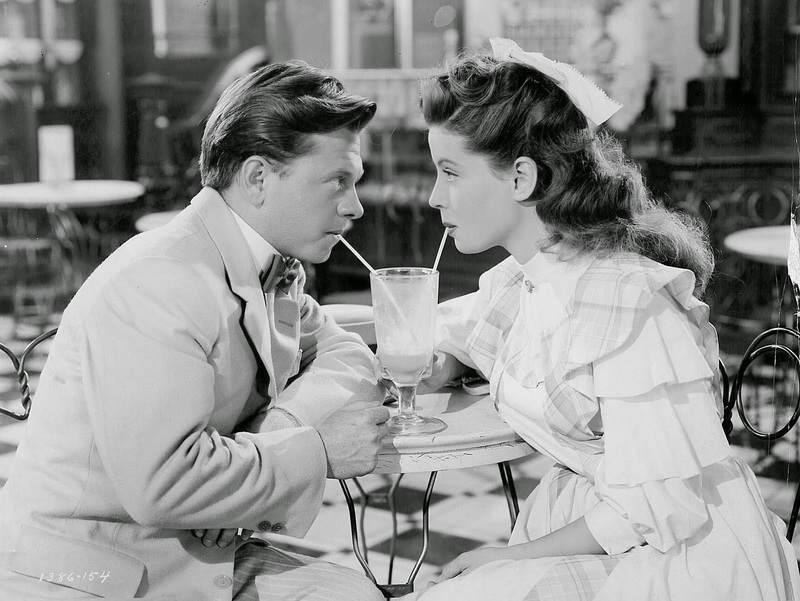 ...A January 8th evening of musicals programmed by Michael Feinstein includes Vincente Minnelli's visually lovely if not completely successful SUMMER HOLIDAY (1948), starring Mickey Rooney and Gloria DeHaven. I haven't seen this one in years and am due for a rewatch. 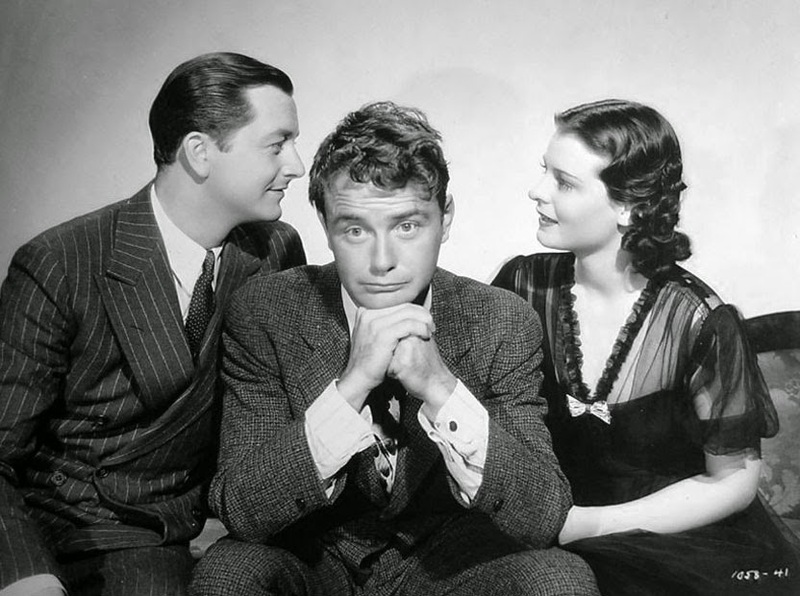 ...TCM shows HERE COMES MR. JORDAN (1941) and its loose sequel DOWN TO EARTH (1947), on January 11th. MR. JORDAN stars Robert Montgomery, Evelyn Keyes, and Claude Rains. Rita Hayworth, Larry Platt, and Marc Platt star in DOWN TO EARTH, with James Gleason and Edward Everett Horton reprising their roles from the earlier film. ...TCM was due to honor Oscar-winning actress Luise Rainer by showing several of her films on January 12th; Rainer would have turned 105 on that date, but sadly she has just passed away, so the day's screenings will now be a memorial tribute. ...Richard Dix, whose work I got to know better in 2014, stars in HELL'S HIGHWAY (1932) on January 13th. 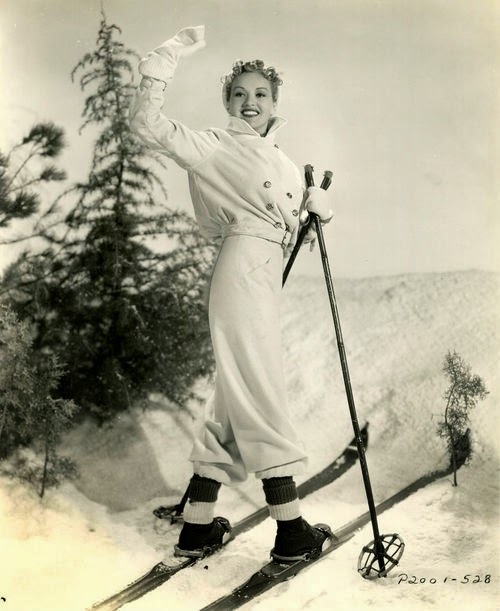 ...January 15th is my favorite day of the month, a tribute to director William Beaudine which features a variety of "B" films starring enjoyable actresses such as Gale Storm, Joan Woodbury, Marjorie Weaver, and Dona Drake. ...Later on the 15th there's COLORADO TERRITORY (1949), Raoul Walsh's Western remake of his own HIGH SIERRA (1941), starring Joel McCrea and Virginia Mayo. I'm considering this title for my list of 10 classic films to see for the first time in 2015. ...Ronald Reagan and Nancy Davis (Reagan) star in the submarine film HELLCATS OF THE NAVY (1957) on January 16th. ...The somewhat unlikely team of Joan Crawford and Fred MacMurray star in the fun, if somewhat improbable, early WWII spy thriller ABOVE SUSPICION (1943) on January 17th. It was based on a novel by Helen MacInnes. 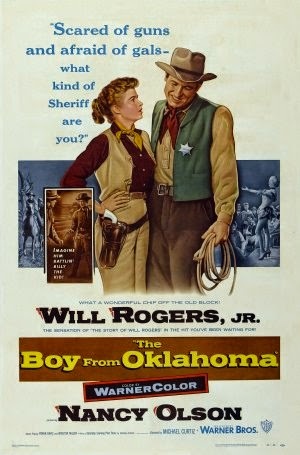 ...Nancy Olson and Will Rogers Jr. star in THE BOY FROM OKLAHOMA (1954) on January 21st. I've heard this is quite a nice little movie. Directed by Michael Curtiz. ...MONTANA (1950) is a fun color Western with Errol Flynn and Alexis Smith. Errol sings! There's an odd, confusing moment when Flynn is supposed to be running toward the camera but it's very clearly not him, it's his stuntman; in fact, I think it was Jock Mahoney. MONTANA will be shown on January 23rd. ...THE HARVEY GIRLS (1946) and YOU WERE NEVER LOVELIER (1942), both showing on Sunday the 25th, are pure movie musical joy. Judy Garland and a large cast are in HARVEY GIRLS, with Fred and Rita in the second film. ...Among several early Donna Reed films showing on January 27th is the unusual GENTLE ANNIE (1944), about a family of kindly train robbers. The cast includes James Craig, Marjorie Main, and Harry Morgan, who gives an excellent performance. ...Robert Montgomery alert! 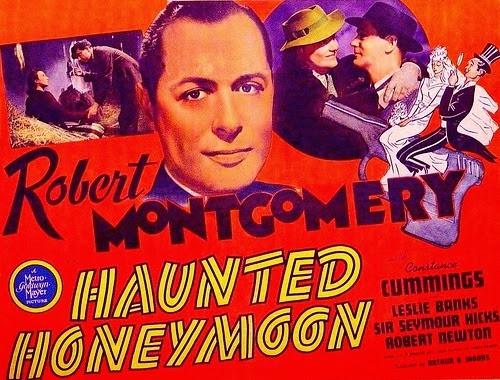 The rarely shown HAUNTED HONEYMOON (1940), with Montgomery as Dorothy Sayers' amateur detective Lord Peter Wimsey, will be shown on January 29th. Constance Cummings costars. Also showing on the 29th is Montgomery in the entertaining THE MYSTERY OF MR. X (1934). ...COUNSELLOR AT LAW (1933) is a terrific pre-Code directed by William Wyler, starring John Barrymore and Bebe Daniels. A terrific movie worth checking out. It's on January 31st. For more information on TCM in January, please visit the online schedule. 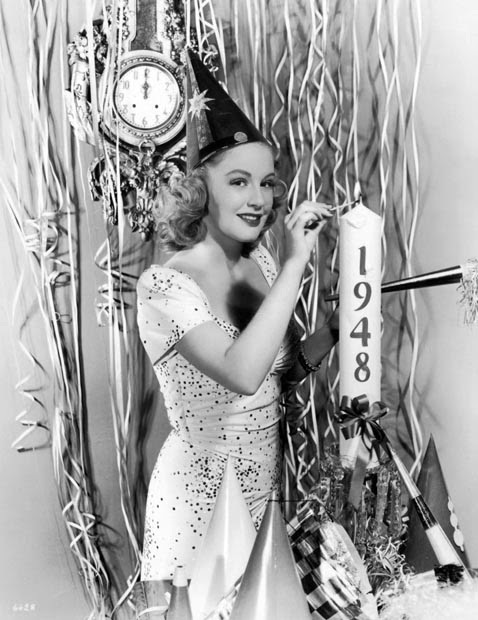 Best wishes for a great 2015 filled with classic movies! Today at Disneyland: Ducks on Parade! It was an absolutely wonderful day today at Disneyland, made especially memorable by our daughter performing in the park as part of the University of Oregon Ducks Marching Band. ...and performed a 15-minute show on the steps of the train station. When I was in high school I sang in the Candlelight Caroling Procession at the train station, so it was moving for me to see my daughter playing with the band in the same spot so many years later. 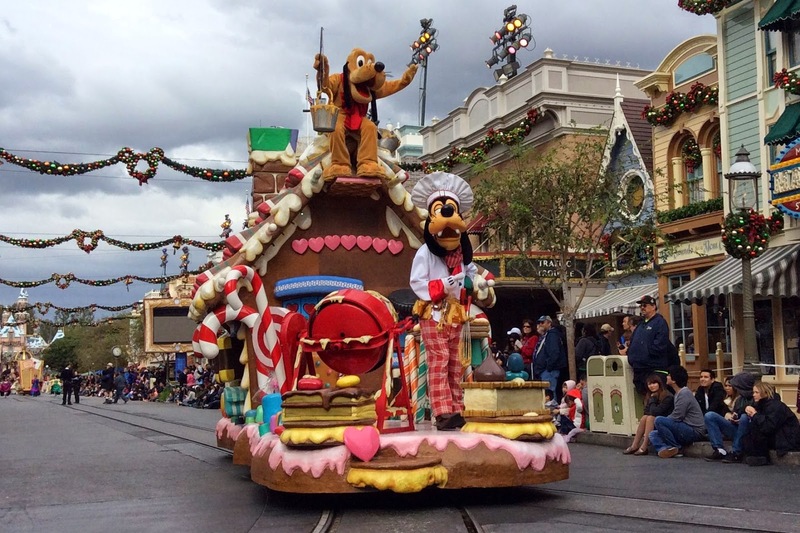 For more photos of this Christmas season at the Disneyland Resort, please visit here, here, here, and here. 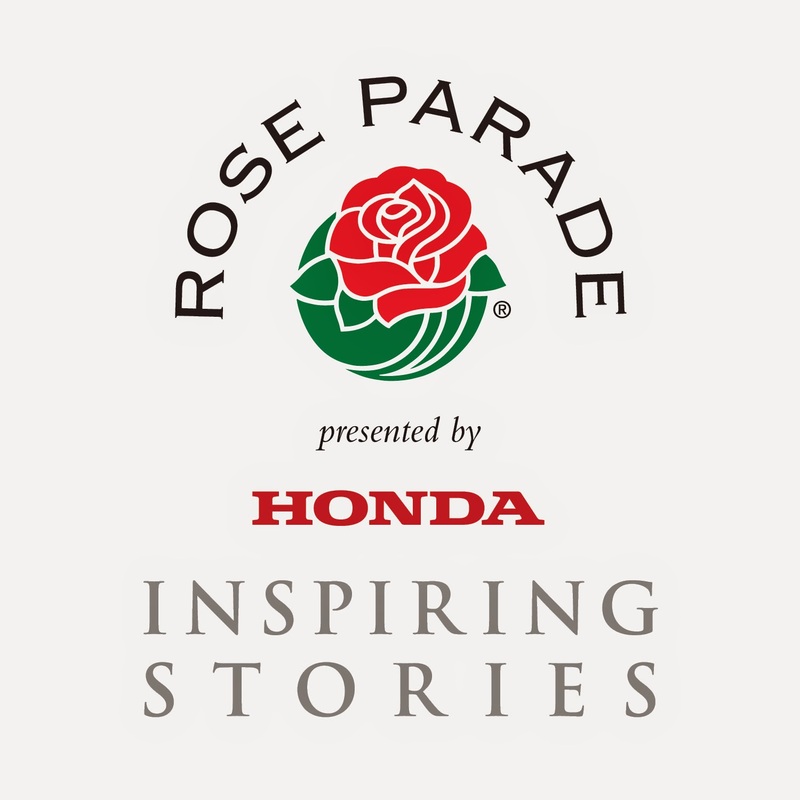 Busy days here, with ongoing holiday activities plus the University of Oregon marching band in town for the Rose Parade and Rose Bowl game. Our daughter is a tenor saxophone player in the Oregon band, and we watched some of the parade practice last night at Glendale College. 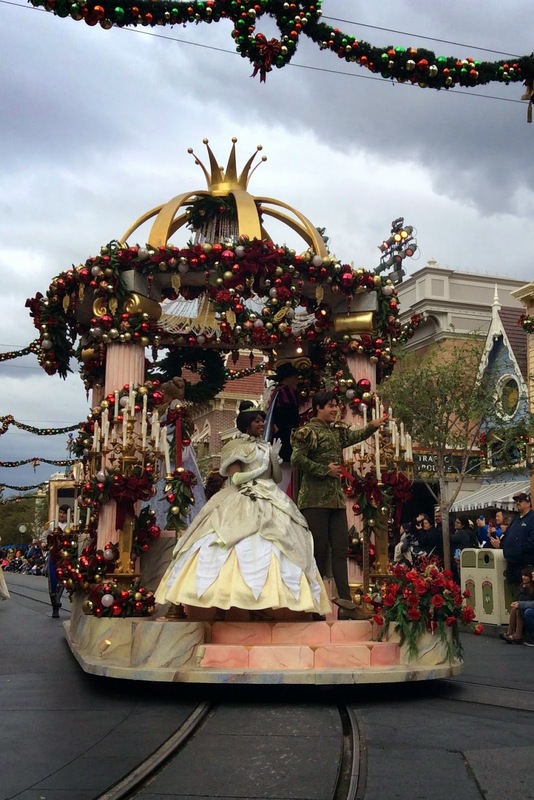 Tomorrow the band performs at Disneyland, followed by a Ducks rally at the Santa Monica Promenade on New Year's Eve. Photos of the band's activities this week can be found at their Facebook page. There was no time for an Around the Blogosphere roundup this week; for anyone who missed last week's roundup, it may be found here. 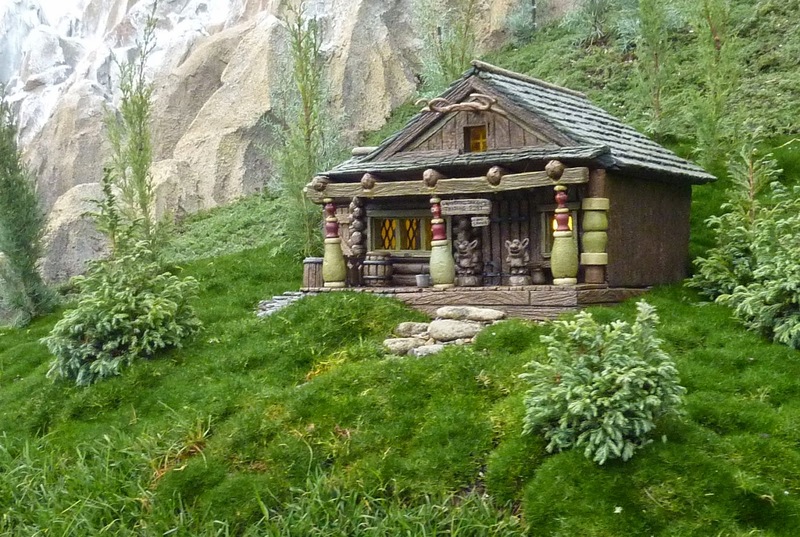 I expect to share Disneyland photos Tuesday evening. As time permits, the coming days will also feature reviews of the final films from my 10 Classics to See in 2014 list, Warner Archive reviews, a look at Turner Classic Movies in January, Disney News, and the annual giant Tonight's Movie: The Year in Review post (visit last year's here). In the meantime, here are some beautiful ladies enjoying this time of the year! 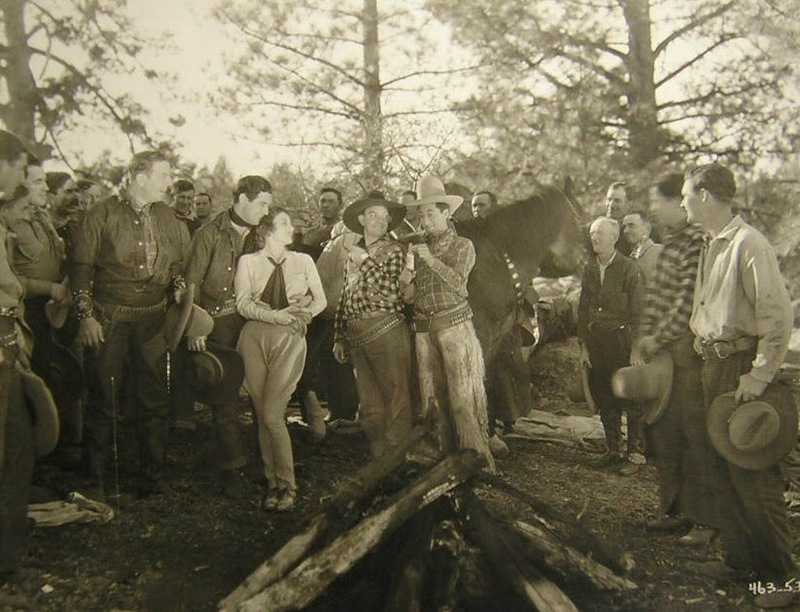 This year I've been enjoying Westerns of the late '40s and early '50s starring Johnny Mack Brown, so it was interesting to back up to much earlier in his career and watch him in MONTANA MOON (1930). MONTANA MOON is a romantic drama costarring Joan Crawford which is available on DVD from the Warner Archive. 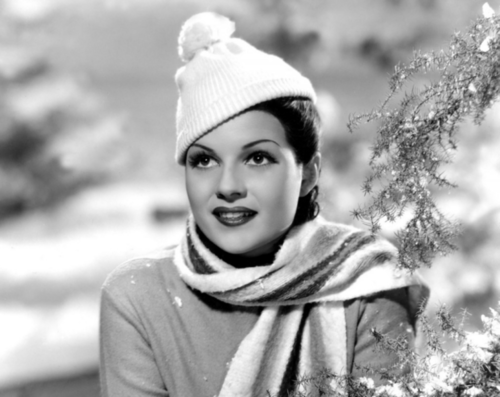 Joan plays Joan Prescott, a wealthy, flighty flapper who sneaks off of her father's private train when it pulls into a rural station in order to escape the unwanted attentions of slimy Jeff (Ricardo Cortez). Joan's sister Elizabeth (Dorothy Sebastian) loves Jeff, but while Jeff is playing up to Elizabeth he also puts the moves on her sister. Joan quickly meets Larry (Brown), a sweet-tempered cowboy with a thick Southern drawl, and they marry in short order. All is well until they visit Joan's family and Joan wants to party all night with her shallow, lazy friends, while Larry expects to be in the saddle working early in the morning. Larry also doesn't like the morals, or lack thereof, of Joan's gang, especially Jeff, and after Larry sees Jeff and Joan engage in a sultry tango, he's had enough. Can this marriage be saved? This is a fairly creaky though watchable movie. The script isn't especially good, and it's particularly inexplicable why Joan seems to have no problems with Jeff when they meet again, given that she left a train in the middle of the night, in the middle of nowhere, in order to avoid him. On the plus side, Joan and John (as he's billed) are both pleasant personalities and it's fun to watch them when they were quite young, though they were still somewhat unpolished performers; Brown, in particular, is rather stiff and awkward at times, miles from the comfortable, casually charming persona of his later Westerns -- and with a much thicker accent! The line deliveries at times make him sound rather dim-witted, but then he smiles and one can see what Joan sees in him. There are also some nice musical sequences, such as Cliff ("When You Wish Upon a Star") Edwards singing "The Moon is Low" by Arthur Freed and Nacio Herb Brown. All in all, it's a film which holds the interest but should have been quite a bit better. It will be of the most interest to fans of Crawford and Brown or those interested in the early years of sound films. The supporting cast includes Mary Carlisle, who is due to turn 101 or 102, depending on the source, in early February. The cast also includes Lloyd Ingraham, Claudia Dell, and Benny Rubin, whose comic routines I found tiresome. This 89-minute movie was directed by Malcolm St. Clair. It was filmed by William H. Daniels, with location work in Idyllwild and at the Chatsworth, California train station. The print and sound of MONTANA MOON are quite nice given the film's age. There are no extras on the Warner Archive DVD. I hope everyone is enjoying a very happy Christmas Day! 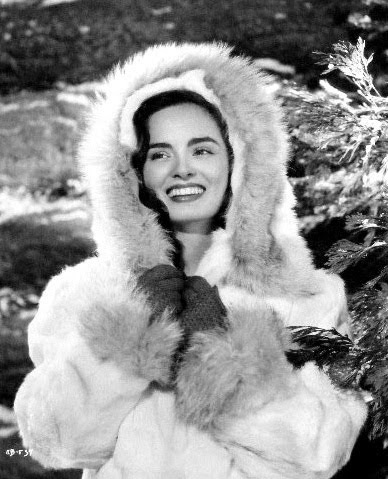 Here's lovely Martha Hyer celebrating the holiday. Best wishes to all for a very Merry Christmas!! 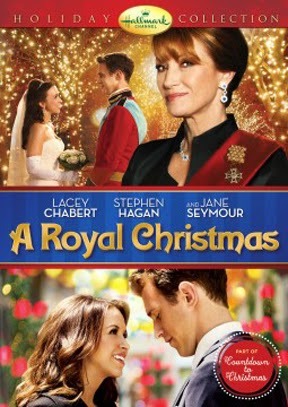 At this time of year there's nothing quite like watching a heartwarming Christmas movie, and the Hallmark Channel delivers with the delightful A ROYAL CHRISTMAS (2014). Lacey Chabert stars as Emily Taylor, a seamstress and aspiring clothes designer who is stunned to learn her boyfriend Leo (Stephen Hagan), who recently graduated with his MBA, is also Prince Leopold of Cordinia. Leo takes Emily home to his small European country to meet his formidable mother, Queen Isadora (Jane Seymour). 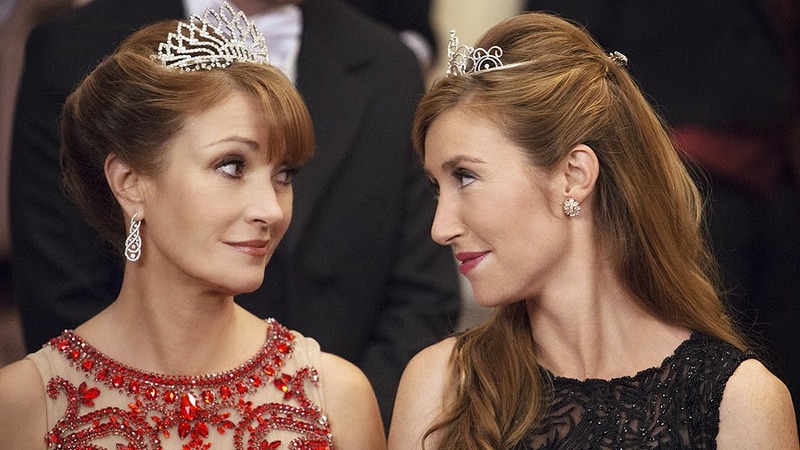 The queen hopes that Leo will marry Natasha (Katherine Flynn, Jane Seymour's real-life daughter), a duchess she considers much more suitable to be bride to the heir to the throne. Isadora and Natasha make Emily's visit difficult, but head butler Victor (Simon Dutton) and the rest of the staff like Emily and offer her their help, and family friend Galina (Kate Loustau) is kind as well. And Leo's steadfast love for Emily never wavers. Will she look past his mother's rudeness and agree to be his bride? A ROYAL CHRISTMAS is quite derivative -- you've seen it all before in films like THE PRINCESS DIARIES (2001) and THE PRINCE AND ME (2004) -- yet it has its own charms thanks to a wonderful cast. Chabert and Hagen are quite appealing, Sutton is funny, and Seymour is wickedly delightful as Leo's ungracious horror of a mother. This being a Christmas film, one can easily guess that eventually Isadora will see the error of her ways. I watched most of this film with a smile on my face and will certainly be pulling out my copy to watch it again during Christmas seasons to come. 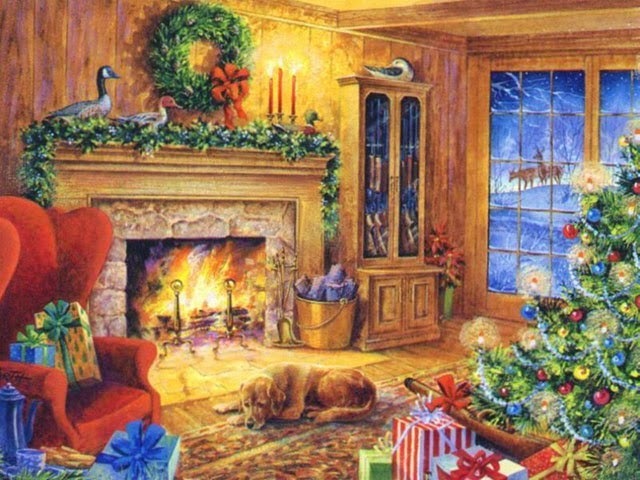 A ROYAL CHRISTMAS runs approximately 81 minutes without commercials. It was directed by Alex Zamm. One of the co-writers was Michael Damian, longtime star of THE YOUNG AND THE RESTLESS, who these days does quite a bit of behind-the-camera work. He produced, wrote, and directed Hallmark's A PRINCESS FOR CHRISTMAS in 2011. 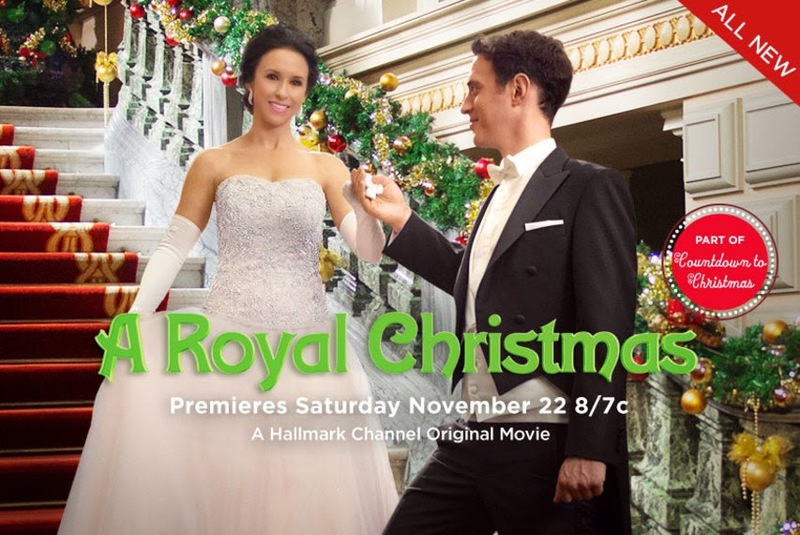 A ROYAL CHRISTMAS is being shown regularly on the Hallmark Channel this month; Hallmark will continue showing Christmas films through New Year's Day. It's also available on DVD. 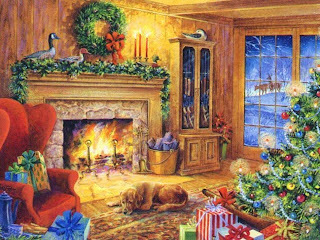 Previously reviewed Hallmark Christmas movies: A CHRISTMAS VISITOR (2002), A BOYFRIEND FOR CHRISTMAS (2004), SILVER BELLS (2005), THE CHRISTMAS CARD (2006), and THE MOST WONDERFUL TIME OF THE YEAR (2008). I should also mention the excellent THE MAGIC OF ORDINARY DAYS (2005) which is partly set at Thanksgiving and Christmastime.